U.S. tax returns and taxes owed for 2017 are due today, April 17. To commemorate, I offer some connections to five posts about federal income taxes from the last few years. Click on the links if you’d like additional discussion and sources for of any of these topics. 2) How much does the federal tax code reduce income inequality, in comparison withsocial insurance spending and means-tested transfers? “The Distribution and Redistribution of US Income” (March 20, 2018) is based on a report from the Congressional Budget Office, “The Distribution of Household Income, 2014” (March 2018). From the post: “The vertical axis of the figure is a Gini coefficient, which is a common way of summarizing the extent of inequality in a single number. A coefficient of 1 would mean that one person owned everything. A coefficient of zero would mean complete equality of incomes. “In this figure, the top line shows the Gini coefficient based on market income, rising over time. “The green line shows the Gini coefficient when social insurance benefits are included: Social Security, the value of Medicare benefits, unemployment insurance, and worker’s compensation. 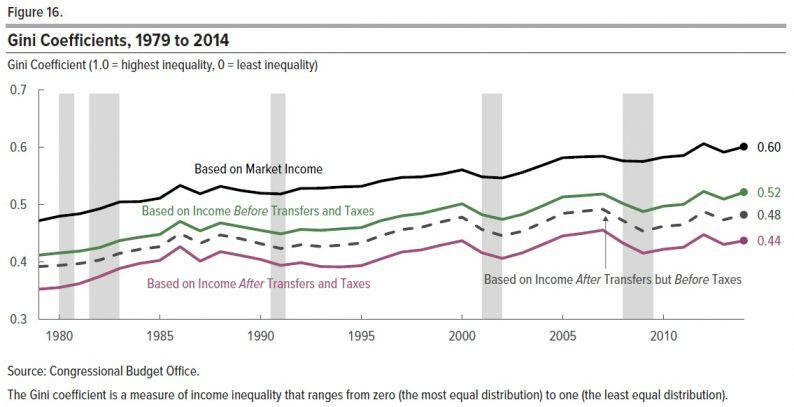 Inequality is lower with such benefits taken into account, but still rising. It’s worth remembering that almost all of this change is due to Social Security and Medicare, which is to say that it is a reduction in inequality because of benefits aimed at the elderly.